The adjustment kit Art. 687 MIX, thanks to the very small size, can be set up straight into the distribution box of radiant heating installations. 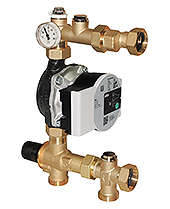 The manufacture allows the mounting on the right side or on the left side of the manifold. Direct connection to the manifold or by means of an eccentric piece 15 or 30 mm (manifold misalignment between the supply and the return). PN 10, maximum temperature 110°C (unit without circulating pump). Connections: to the manifold 1” Male swivel connection or 1” Swivel nut; to the circuit 1” Male with 96 mm centre distance. For power up to 11 kW (with Δt 8 K) and maximum flow 1200 l/h. 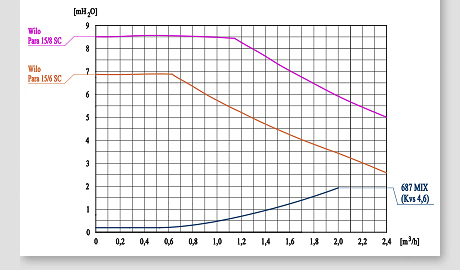 Approximate data calculated with a 6 m nominal lifting power circulating pump. For an accurate measuring or for higher flows, please refer to the curve. Attention. Codes variance. For the version 1” Male please replace the letter “C” after the article with “G”. For the versions without the circulating pump please skip the identification code of the pump “-P6” / “-P8”.